Carlsbad, CA had a surprising number of burger places, and Tip Top Meats got some good reviews, so Happy Meal and I went to check it out. It should be noted that Tip Top Meats serves up an awe-inspiring amount of food for a low price. For about 17 bucks we got a a Double Cheeseburger ($4.98), a Single Cheeseburger ($3.49), fries, a drink, a slice of German Chocolate Cake, and a slice of Black Forest Cake. Tip Top Meats and European Deli has been around since 1967. It was part restaurant/deli, part German grocery store, and part butcher's shop. We got all of our Christmas cookie shopping done while were there, too. If I lived in Carlsbad, I'd eat a lot more steak--the butcher's case looked fantastic. ﻿﻿ The Beef: We were assured that the beef was ground round. Accordingly, we ordered Med Rare. What we got was a very fat-heavy (25%? 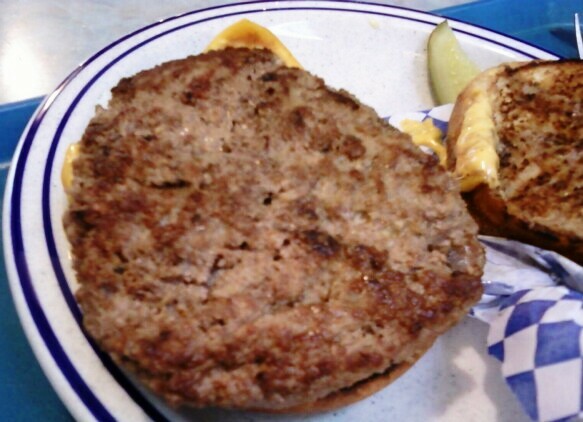 ), medium ground patty. There was no trace of aging in our burgers. The flavor was very mild. These were oily, bloodless, and mostly bland burgers. I believe that these were sourced from chuck rather than round. The mild flavor really left me wanting for more. For 5 bucks, it was a foolish dream to hope for anything better than chuck, though. The Sear: The sear was spotty and weak. It did not provide any crunch, flavor, or texture. The Preparation: The burgers were griddled on a not-hot-enough cooking surface. The beef was ground in-house and formed loosely into 5-6 oz. patties--the menu claimed 4 oz., but the menu lied. 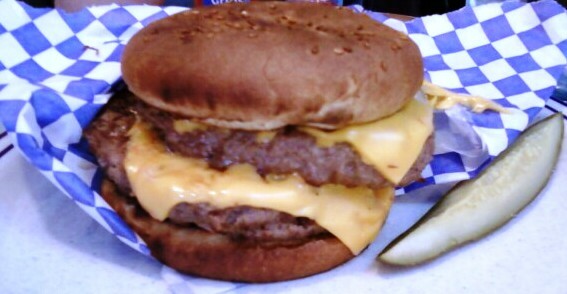 The Double Cheeseburger was MASSIVE. I ate half of it before I relented. The Cheese: Perfectly melted American cheese provided the salt that the dish required. The cheese also added some moisture to compensate for the over-toasted bun. The Bun: The bun was a standard hamburger bun, but because it was over-toasted--they got the bun browner than the burger patty--it was a little too dry. For some reason they scorched my top bun, but they did not toast the top of Happy Meal's Single Cheeseburger bun. Puzzling. 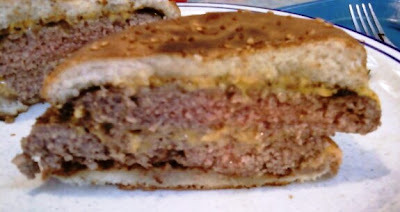 The Meat to Bun Ratio: In spite of the copious quanitity of oily beef in the Tip Top Meats cheeseburger, the dryish bun managed to stand up and hold the dish together. The Fries: Meh--they were cooked in a low smoke point oil, so they were not crisp or brown. Also, the oil had started to break down in the fryer, so the fries were a little bitter. The Value: WOW! The portions at Tip Top Meats were Brobdinagian. There should have been a Surgeon General's Warning on the window of the place. There was nothing on the menu over 9 bucks, and all of the German dishes looked authentic and good. The cheeseburgers at Tip Top Meats probably would have been better had we ordered them Medium, since the beef was most likely chuck rather than round. Even so, the lack of sear and seasoning would have created a sub-parr dish anyway. I would return, but not for a cheeseburger. Burger Review : Tip Top Meats served a huge amount of food for a low price, but it was prepared in a fashion that delivered lackluster results.